By Tom Crick, Software Sustainability Institute Fellow and Senior Lecturer in Computer Science, Cardiff Metropolitan University and Alan Winfield Professor of Electronic Engineering, UWE Bristol. Republished with permission from the original post on the Guardian Higher Education Network blog. Further to my session on academic blogging with Alan Winfield at Engage 2013 (the National Co-ordinating Centre for Public Engagement‘s annual conference) in November, we have generated a few top tips, which were published on The Guardian Higher Education Network’s blog. Academic blogging has been a recurring theme on the Guardian HE Network blog, which last week looked at why academics blog, as well as highlighting some of the potential risks. Academic blogging is now recognised as a valuable part of the wider ecology of scholarship, with the potential for engagement, outreach and reinforcing academic impact. This list isn’t just for scientists, also see the excellent LSE Impact of Social Sciences blog for a range of thoughtful posts. Write about yourself and your life: people are just as interested in researchers (and their activities) as their research; also write about what goes wrong as well as right — the human story of failed experiments is interesting but rarely gets told. Take your time to find your blogging voice. Don’t worry if it takes a year or more. Your blog will evolve as you discover your style, which might be short topical pieces or long-form reflective essays (or a combination thereof). Read other academic blogs and you’ll quickly see the range of voices. Be reasonably clear about what your blog is for e.g. musings on life, the universe and everything, or a specific theme/topic. Although again let the scope evolve; it can be difficult to start blogging with a mission statement, but it is useful to think about what you would like to achieve with your blog. Blog as yourself. While there are circumstances in which blogging anonymously is vital, in the general case it is better to be clear and open about you and your academic position. But at the same time don’t give the impression that you are writing on behalf of your university (unless you are). Think about the degree to which you want to be controversial. Calibrate the degree of controversy according to risks (especially for a PhD student/early career researcher vs. tenured professor); in general, only be prepared to put something on a blog that you’d be prepared to say to someone’s face (or shout out in a crowded room). Being controversial can be fine if you are a senior academic, but be mindful that your position (Dr, Professor, etc.) lends a level of authority to what you write — so make sure you’re happy for your words to be quoted. Remember: a blog post is a publication. If you are writing about ongoing research which is not yet published or patented, then be mindful of the dangers of prematurely revealing details of potential inventions or intellectual property. Let your university know about your blog. 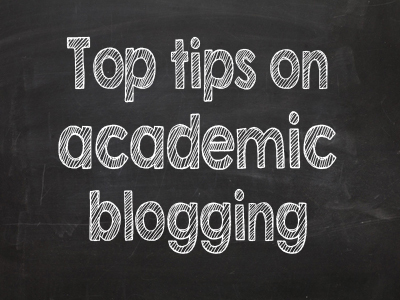 Have a chat with your line manager about your intention to start an academic blog. You might not need their permission, but it’s best if your blog doesn’t come as a surprise to your manager or institution at an inopportune time. Think about how often you want (or are able) to blog. If your blog acquires a following then your readers will look forward to your next post, so don’t put yourself under pressure by creating expectations of (say) a blog post every few days when you know you can’t keep it up in the longer term. Make use of other social media to promote your blog (if you want!). Twitter is an easy way to tell the world that you’ve just posted a new piece on your blog, opening up wider interaction and engagement. And finally (and perhaps most importantly): blog because you feel the urge to, not because you have to — it should be fun, not a chore! There are already plenty of onerous tasks for an academic, this should not become one of them.